There’s Dead Lucky by Lincoln Hall, who was rescued after a night out on Everest, but only after another climber, David Sharp, was left for dead a week earlier, causing an international wildfire of online accusation that did not go unnoticed in base camp. There are several books about K2 in 2008, which killed several climbers in a series of overnight avalanches, causing a rash of heroism from the climbers and second-guessing from their aficionados around the world. Some rise above the fray, like elite mountaineer Ed Viesturs, who in No Shortcut to the Top covers his own life and his successful climbs of all fourteen 8,000 meter peaks without oxygen. He also explains why he considers it dangerous not to use oxygen when working as a guide. The 1996 Everest disaster is covered in numerous books, and Into Thin Air by Jon Krakauer is only one of them. As a journalist, he is partly blamed for the event itself, in speculation that his very presence on the mountain caused the leaders of the two largest expeditions to test their luck further than their normal sensibility would have allowed them. He also blames climber Anatoli Boukreev, for guiding without oxygen, thus speeding up his own trip, leaving the summit and reaching camp IV before nearly everyone, including his clients. Yet, Boukreev is the only one in camp who is able to go out into the blizzard later to rescue others. Of course, Boukreev has his own book, The Climb, covering his own side of the Everest disaster. 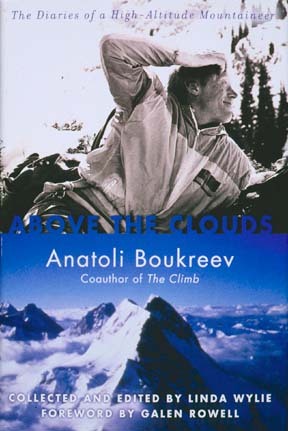 I am currently reading Above The Clouds, a collection of Boukreev’s diaries from his numerous ascents, postumously published in 2001 (he died in a Christmas Day avalanche on Annapurna in 1997). This book opens with forewords and introductions by his defenders, scratching raw the disagreements that seem to be a lot more plentiful than oxygen on the high peaks, and perhaps always have been. So here I am, fifteen years later, catching up on these events and finding myself unable to avoid passing judgment on these people, despite the fact that I would rather be reading stories about the Whites. If only somebody would write a book about an epic adventure in the Pemigewasset wilderness, or a traverse of the southern Presidentials after a hurricane tore through the forest. How about a book with a collection of tales that end with prime rib at the Common Man or a burger at the Red Parka, or getting turned around by the maitre’d at the Mount Washington Hotel because you looked like you just crawled out of the backcountry (which you did). I’d read all of them. Maybe that’s why I’m so looking forward to reading UP by Patricia Ellis Herr, about hiking New Hampshire’s 4,000 foot peaks with her five-year-old daughter. It will be available in April 2012. Then I can return all these Everest books and start reading about peaks I can actually visit myself. This entry was posted in Hiking and tagged 4000 footer books, 4000 footers, climbing books, climbing stories, hiking books, hiking stories, LinkedIn, mountain climbing, mountain hiking, mountaineering, mountaineering books, mountaineering stories, mountaineers, nh mountain books, nh4k books, nh4k stories, white mountain books, white mountains by Tom Bishop. Bookmark the permalink.